September 2018, the Mix Lab is entering it's 4th fall, and this summer we completed our 3rd redesign of the MIX Lab space to accommodate our rapid growth. September 2018 we will open our doors with more storage to handle equipment, additional space for classes, an inner window to the hall and a slick paint job. 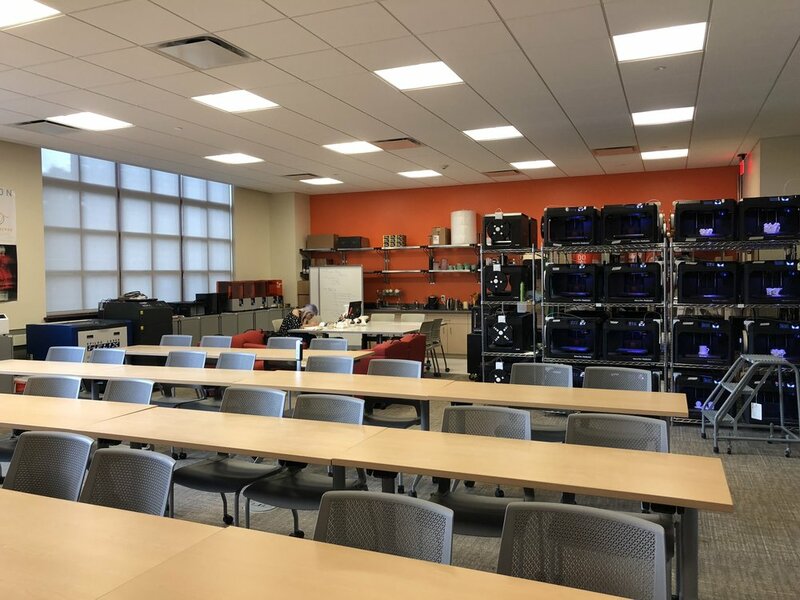 The MIX Lab space is purpose designed with 60+ 3D Printers and digital fabrication machines, movable chairs, tables, cabinets and lecture space. View of the MIX Lab door in the hallway. The only red wall in the School of Business building. Tours come and go throughout the day while class is ongoing. We hope you will stop by to visit us and check out what is new!